What are the most common English idioms used today? This post lists the 150 most popular idiomatic expressions to help you sound more like a native English speaker! Our A-Z of idioms gives you the meaning of each expression, along with example sentences. Don’t forget to download your free pdf copy of this guide and to practise your skills with the exercises at the end! An idiom is a phrase or group of words that, when taken together, has a meaning that is different from that of each individual word. To put it another way: idioms cannot be understood literally. For example, ‘Once in a blue moon’ means ‘when something happens rarely’. So the example sentence: ‘I eat McDonalds once in a blue moon’ doesn’t make any sense when the words are taken literally (you only eat McDonalds when there is a blue moon?!). 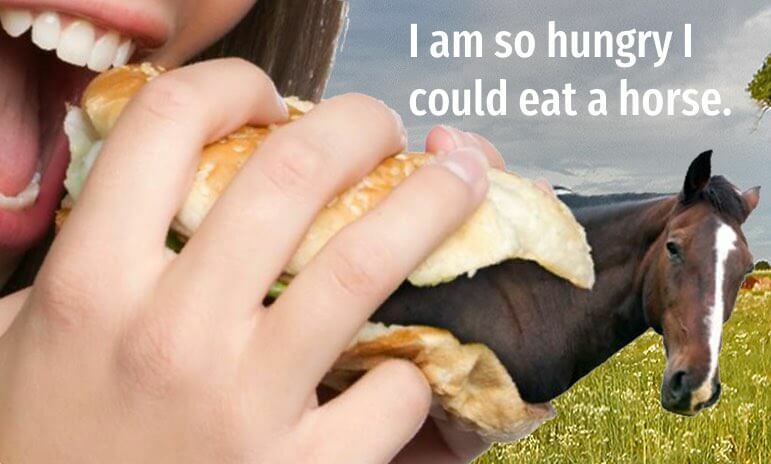 But when you understand the meaning of the idiom, the sentence makes perfect sense (you don’t often eat McDonalds). Idioms are very important when learning English because they are used a lot in everyday communication and can help you sound more like a native. To speak and understand conversational English better, learning the correct use of idioms is essential. Idioms also help give character to the language; making it more colourful and interesting. 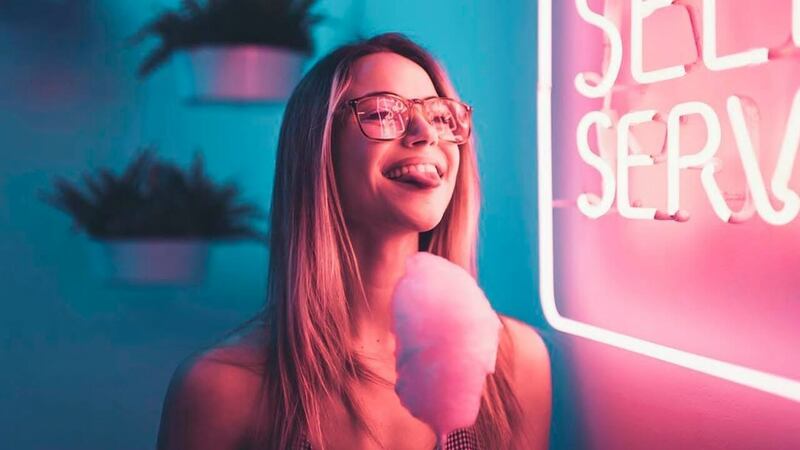 In this study guide, we’re going to walk you through the most common 150 English idioms used today, with their meanings and example sentences. We will also highlight a few outdated idioms that you should avoid, and give you some exercises to practise your understanding. Missing that plane turned out to be a blessing in disguise because I got to spend more time with my family. He brought only shorts and t-shirts when he went to Sweden in the winter – I think he might be a sandwich short of a picnic! Luckily the wedding is just a stone’s throw from our hotel so we can walk there. When Sarah started laughing during the argument, it really added fuel to the fire! As if breaking my arm isn’t bad enough, to add insult to injury I have to pay £1,000 in hospital fees as I didn’t have travel insurance! I was at a crossroads when I was offered a job in the US, but my boyfriend wanted to stay in London. He thinks the company’s problems can be solved just by firing the sales team, but he’s barking up the wrong tree. Stop beating about the bush! Are you planning to quit university, or not? You’re going to have to bite the bullet and tell your ex-(girlfriend) that you need the apartment back. After my meeting with the boss, I went for a run to blow off steam. To make the salad dressing, you just put oil, vinegar, honey and mustard into a bowl, mix them together and bob’s your uncle! Despite the excellent reviews, we thought the restaurant was just bog-standard. When learning idioms in English, you need to watch out for old-fashioned expressions. For example, you probably know the idiom ‘It’s raining cats and dogs’. However, most Brits would never use this expression now. It is outdated. Instead we say: ‘It’s bucketing it down!’, ‘It’s chucking it down!’ or ‘It’s pi*sing it down!’. The original builders did such a bodge job of our kitchen that we had to get it completely redone. Could you budge up a bit so I can sit down? I’ll have a builder’s tea, please. Martin just buries his head in the sand when it comes to his financial problems. I was busting my chops all night to get that report finished! Stop busting my chops! I’ll mow the lawn later. Note: In British English slang, the word ‘chops’ is used to mean ‘mouth’. So the idiom above literally means ‘punch in the mouth’. The traffic was terrible so we only made the plane by the skin of our teeth! I know he’s your brother, but let’s call a spade a spade: he’s pretty lazy. It’s almost 9pm. I think we should call it a day and finish the report tomorrow. It doesn’t look it, but our new sofa was (as) cheap as chips! John and Maggie from the office haven’t actually announced they’re getting a divorce. It’s probably just Chinese whispers. Whenever we mention his childhood, he gets really angry. He’s got a chip on his shoulder about it. The new sales guy at the office has a real chip on his shoulder. He’s not even that good! When Bill came into the room, Jenny just seemed to clam up. I think she likes him! He’s getting cold feet about the wedding, but I told him that was perfectly normal. I got the cold shoulder from Anna at the party. I guess she’s still annoyed with me. That Italian meal cost a bomb! We won’t be going back there, unless we win the lottery! The new bar in town was really fancy, but my drink cost an arm and a leg! 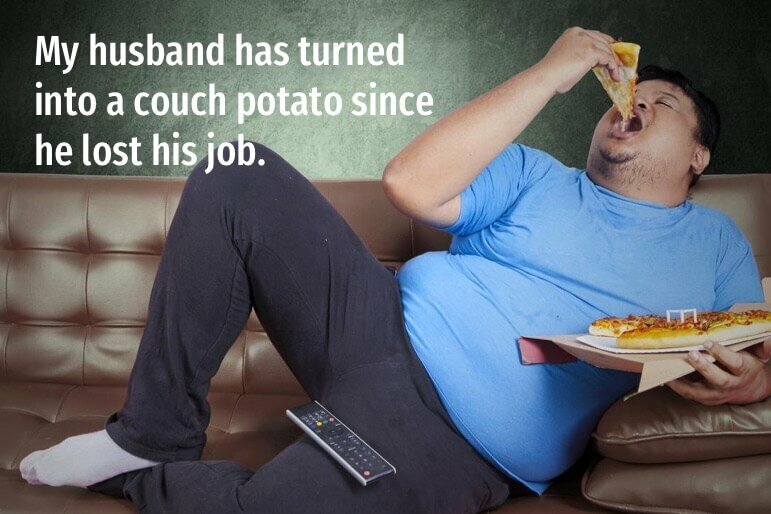 My husband has turned into a couch potato since he lost his job. I couldn’t care less if Harry comes out tonight or not! I don’t really like the guy. To cut a long story short, she has to move back to the US until her new visa comes through. We had to cut corners to get the project done within our budget and by January. I have to leave in a minute so can you cut to the chase? What exactly do you want me to do? I wanted to go on the earlier train, but Mary dug her heels in so we had to get the later one. The music industry is dog eat dog these days. I’d stay out of the legal sector. It can be a cut throat business. Although you’ve made an offer on this house, I would still visit some others. You don’t want to put all your eggs in one basket. If you’re not very good at swimming, I’d stay in the shallow end and keep close to the side. You don’t want to run before you can walk. She moved to Australia after she found out about her husband’s affair. I suppose desperate times call for desperate measures! Easy does it! Those boxes you’re holding are very fragile. David leaving the company was the elephant in the room during that meeting – no one wanted to bring it up! I might have lost my job, but at least I don’t have that awful journey into work every day. Every cloud…! I’m meeting Hannah tonight and it’s the first time I’ll have seen her since our argument. I guess I’ll finally have to face the music. I’ve only been at the new company for a month so I’m still finding my feet. Judy was like a fish out of water at the kids’ party. I don’t think she likes children at all! He’s in his 90’s, but he’s fit as a fiddle! All the men in my family are doctors so I’ll probably follow in their footsteps and go into medicine too. I freaked out when I saw The Rolling Stones perform. I’d wanted to see them my whole life! That Goth at the club freaked me out a bit because he was dressed like a vampire! You’re full of beans this evening! You must have had a good day at work. I wish she would get off my back about the meeting! I know I have to send the agenda out, but I’ll do it in my own time. The protest got out of hand and the police had to intervene when some demonstrators broke down a fence. I don’t drink much anymore; I got it out of my system when I was at university! You’re very argumentative today! Did you get up on the wrong side of bed, or something? I haven’t got any work done this morning – I really need to get my act together! Hannah said she missed the exam because her car broke down. I’m not sure that was the case, but let’s give her the benefit of the doubt. I was very glad to see the back of John because he made the atmosphere in the office so uncomfortable. The client didn’t like our original concept so let’s go back to the drawing board! I gave up smoking by going cold turkey; it was difficult but it was also the only thing that worked for me. Let’s not go down that road again! It always leads to an argument. Frank is a great asset to our team as he always goes the extra mile. I always think the countryside looks nicer than the city, but I guess the grass is always greener…! I’ve heard you have green fingers – we’ll have to get your advice about our garden! Hang in there! I know it’s tough but you’re almost halfway through the course. You need eyes in the back of your head when you have two small children! They’re head over heels in love with each other! I heard (it) on the grapevine that you and Alex are splitting up. Is that true? After dinner I’m really going to hit the books. Not much time left before my exams! I think Lucy hit the nail on the head when she said there’s no such thing as an ideal school. There are pros and cons to all of them. It’s getting late so I’m going to hit the road. It’s been a long day so I’m going to hit the sack. Night night! In English, there are many ways to say ‘Wait a moment’. Next time you want to express this idea, try one of the following expressions: ‘Wait a sec’ (second), ‘Hang on a tick’ (like of a clock), ‘Give us a mo’ (moment). You just need to fill in the form and you’ll get an e-ticket. It’s not rocket science! Everyone thinks Boris is going to win the election so they’ve jumped on the bandwagon. I don’t think the company is going to survive. We should probably jump ship! It’s been a difficult month for you but keep your chin up! It will get easier. I could pick up the dry cleaning on my way the doctors. That way we’d be killing two birds with one stone. During firm’s the financial audit they left no stone unturned. Don’t bring up what happened at Alison’s party again. You should just let it lie. It was my turn to do the washing-up, but mum let me off the hook because I wasn’t feeling well. Their engagement was meant to be a secret, but Adam let the cat out of the bag! You look like a million dollars in that black dress! I tried to chat a girl up at the bar the other night, but she just ignored me. I must be losing my touch! I would call the company back now about the job and not wait until the morning. 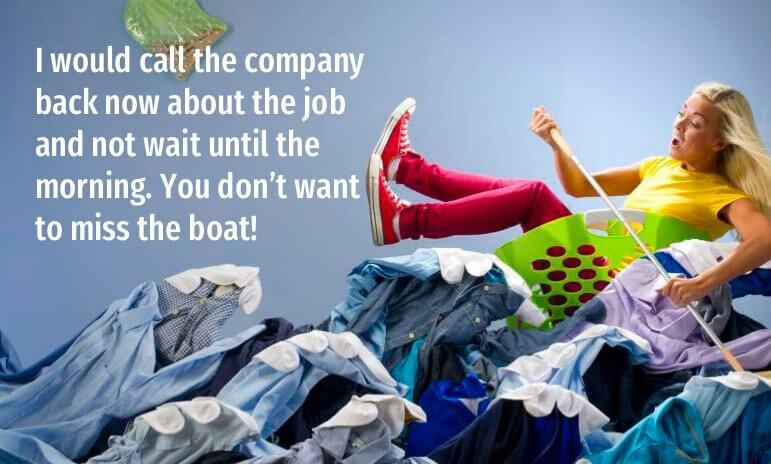 You don’t want to miss the boat! I’ve noticed that people are starting to arrive late for work. I think we need to have a meeting about it and nip this in the bud before it becomes a real problem. She’s a great cook, but the meal she made really wasn’t my cup of tea. It was far too spicy. You must be off your trolley if you think I’m going to climb up there! It’s way too high! Off the top of my head I think we’re expecting about 18 guests for the party, but I’ll check to make sure. You really need to be on the ball in this job because it’s fast-paced with lots happening all the time. Those lads on the dance floor look like they’re on the pull tonight! He was very wild for many years, but he seems to have grown up and he’s on the straight and narrow now. I eat McDonalds once in a blue moon, when I feel like a treat! My English exam was a piece of cake. If we all pitch in we can get Charlie a really nice birthday present. You’re pulling my leg! I don’t believe you met Elton John at the pub! You need to pull yourself together! Stop worrying about work so much. You’ll need to raise your game if you’re planning on beating Anna’s time in the half marathon. The kids are all getting along fine at the moment so let’s not rock the boat. As a rule of thumb, you should use two cups of water for one cup of rice. My boss got caught taking free holidays from a company client! I think it was a case of “you scratch my back, I’ll scratch yours”. We don’t see eye to eye when it comes to politics, but I do like her as a person. You were in the office on Tuesday when the incident took place so perhaps you could shed some light on it for us? There are a lot of people still sitting on the fence over Brexit. Sit tight! The nurse will be with you in just a moment. You don’t have to decide straight away. Why don’t you sleep on it and let us know in the morning? I thought I could smell a rat when john refused to give me a straight answer about his sales figures! Now we know he’s been stealing from the company. We had invited everyone round for a BBQ today, but the rain has really thrown a spanner in the works! Did you hear about what happened to Michael? …Oh speak of the devil, here he is! We are throwing David a surprise birthday party, but please don’t spill the beans! We splashed out on new phones for the whole family. This industry is so competitive; it’s easy to get stabbed in the back by your closest colleagues. My sister is always stealing my thunder – I announce I’m getting married and she tells everyone she’s pregnant! 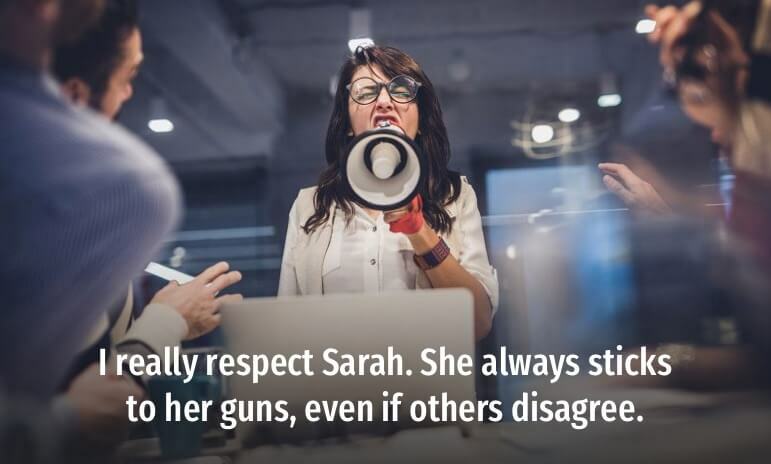 I really respect Sarah. She always sticks to her guns, even if others disagree. Dave’s a laugh, but he always taking the mickey out of you down the pub. £4 for a cup of coffee? They must be taking the pi*s! I would take Sam’s motoring advice with a pinch of salt. He doesn’t actually know much about cars. My boss is a real bully. Someone should give her a taste of her own medicine! I’ve told you how I feel about the wedding so the ball’s in your court now. He lives in England during the summer and lives in Australia during the winter months so he gets the best of both worlds. When the dog destroyed their antique furniture it really was the final straw. After that, they decided to give poor Rex away. John and Chloe have stayed together through thick and thin. I can’t believe it’s 10pm already! Time flies when you’re having fun! I didn’t want to go out tonight, but Ruth twisted my arm! Sarah’s not going to come out tonight. She’s had a busy week and is feeling under the weather. Person B: “We’ll cross that bridge when we come to it“. We were told that if we searched the library archives we might get some answers, but it turned out to be a wild goose chase. I wouldn’t be caught dead wearing those shoes – they’re so ugly! I can’t wrap my head around why Megan would leave London for Rotherham! Choose the correct option that best expresses the meaning of the idioms below. Watch out because in one of the exercises two answers are possible! She is very good friends with Martin so perhaps she can ____________ his behavior. I ________________ going to that club – It’s awful! I’d love to __________ and buy the whole family a really nice holiday somewhere! Find this post useful? Share it with friends!